A scene from Disney's "The Beauty and the Beast" Broadway show in India. After staging its first Broadway show in the Indian city, Mumbai, U.S. entertainment conglomerate Walt Disney Company is bringing the production to the capital, New Delhi. Theater fans hope bringing a Broadway musical to India will help pull in more audiences at a time when the vibrant film industry, Bollywood, steals the show. Mumbai resident, Pooja Razdan’s only experience with Broadway theater was The Lion King in Sydney, and she had never expected to see one of the musical extravaganzas in Mumbai. “I got to know about it by chance when I was on BookMyShow booking movie tickets, but I was really excited because they claimed that it was on Broadway standards… it met up to my expectations, I really, really enjoyed it as a musical,” Razdan said. 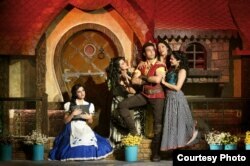 Disney's "The Beauty and the Beast" Broadway show on stage in India. Disney has tested the Indian waters with one of its most famous Broadway shows, Beauty and the Beast. It is being performed by an all Indian cast and crew. After staging the popular fairy tale to packed audiences in Mumbai, the show comes to New Delhi on Friday. Siddharth Roy Kapur, the head of Walt Disney in India, said he not surprised that the Broadway show resonated with an Indian audience. “Musical theater is really in essence as Indian as it gets. Our songs, our dances, our drama, we love large emotions. You know it really does lend itself to an Indian sensibility in many ways and I think we were only held back because of lack of resources and the lack of venues in the past,” Kapur said. Although India has a rich tradition of theater, it has been eclipsed by the hugely popular Hindi film industry. Bollywood produces some 1,500 movies and sells nearly 2.7 billion tickets a year. That is not surprising. Bollywood’s romantic stories and glamorous stars have captured popular imagination and a movie hall is usually the first port of call for those seeking an evening out. On the other hand, theater productions have been struggling. Nobody knows that better than Ila Arun, a veteran Mumbai-based theater artist for four decades. She hopes a musical extravaganza mounted on a grand scale Broadway-style will revive interest in live entertainment and make it easier for theater to find sponsors. “There was a time when English theater was doing very well here and some of the regional theater was doing very well. That era is finished and the time came [when] to get the audience into the theater is a task. Broadway will change the idea,” Arun said. FILE - Walt Disney cartoon characters Mickey Mouse (L) and Minnie Mouse pose at the Taj Mahal in Agra, India, Oct. 30, 2008. Disney staged its first Broadway show in India in Mumbai in 2012. Walt Disney’s foray into India was prompted by a rising middle class with disposable incomes that is hungry for new experiences. Although ticket prices, ranging from approximately $45 to $120, are expensive by Indian standards, they have found quick takers. Ila Arun hopes an effort will be made to take Broadway theater to those who cannot afford to pay such prices. “As a theater person I feel if one of the days they open it for the masses, the theater lovers with some concessional rates, probably they might reach out to the masses,” Arun said. A scene from "The Beauty and the Beast" Broadway show being staged by Disney in India. After Beauty and the Beast, Disney is gearing up to give India more Broadway experiences. Kapur says the next show could be staged later next year. That has also raised hopes that Indian theater artists, who have struggled to make a living, will find more venues for their work.